Lola French is stunned when she wins millions on the Lottery, and she is sure all her dreams are about to come true. However, right from the start, before she even claims her winnings, things begin to change and she separates abruptly and acrimoniously from the man she has been living with. Lola’s colleagues are initially pleased for her, but eventually begin to resent her new status. One of them, Tom, whom she really likes, asks her out; but he does it on the day that news of her win spreads through the office and she sadly turns him down. She decides to leave her job as a Financial Adviser in Edinburgh and explore the limitless possibilities of her new lifestyle. When Lola and her mother excitedly set off on a Mediterranean cruise, it's not long before they both meet men they are interested in. However, their holiday of a lifetime catapults them into a life-changing sequence of dramatic and terrifying events that neither of them will ever forget. When she has to return to reality, Lola unexpectedly finds herself involved with Tom again! But the storm clouds are looming overhead, and as the recent past catches up with her and forces her to confront violence and danger once more, Lola risks losing Tom forever. 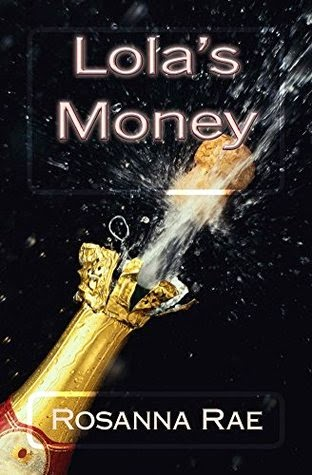 Lola's Money by Rosanna Rae is a 2015 publication. I was provided a copy of this book in exchange for an honest review. Mo' money, Mo' Trouble. We've all heard variants of that at one time or another, but who among us can deny we have not fantasized at one time or another about winning the lottery. After her major win, Lola has no intentions of leaving her job or going on huge shopping expeditions. The major change that takes place in her life is in dumping her no good boyfriend, Alan, and moving back home with her mom. But, her work environment gets strange as her co-workers begin to treat her differently and Tom, the guy she is interested in only notices her AFTER her lottery win becomes public knowledge. He promptly begins dating another woman when Lola calls him out on it. So, despite her attempts at normalcy, Lola gives her notice, goes shopping, changes her looks, and books a cruise for herself and her mother. Why not? Well, once aboard the cruise, Lola and her mother meet men and experience whirlwind romances. But, both decide to pursue their new relationships after the cruise is over. Each accuses the other of moving too fast, and for the first time Lola and her mother feel a shift in their once close relationship. However, one of these ladies does indeed chose the wrong man to become involved with and will pay a high price as a result. This book is written in three parts beginning with Lola's lottery win, the breakup with Alan, the decision to leave her job and take a cruise. Part two introduces us to the new man in Lola's life, her decision to see where the relationship will take her and the distance it puts between her and her mother. But, it also leads us to understand the two ladies are in imminent danger. Part three has Lola coming full circle as she and her mother return home from their travels and attempt to to put their lives back in order. But, their troubles are not over by a long shot. Tom and Lola do manage to put any misunderstandings behind them, but not everyone is thrilled by this, and it would seem Lola has a stalker. Is it one of the men Lola met on the cruise? Tom's ex-girlfriend? Or Alan? Before all is said and done, Lola will have learned who her real friends are, and what is really important in life. I think the author did a fantastic job of capturing the difficulties one might face after coming into a large sum of money. People came out of the woodwork and wanted to establish relationships with Lola, and despite her attempts to keep the money a secret and not let it change her, it is impossible for something like that to stay hidden. Once people knew about Lola's windfall, they were the ones who changed towards her. It wasn't until this happened that Lola began to change. This is evident once she starts to plan the cruise. Her personality changes, she becomes haughty, over confident in her choices, and begins to disrespect her mother. After going through a harrowing ordeal, Lola begins to morph back into her old self again , having learned some valuable lessons in the process. Lola made for an interesting character study because she was trusting of complete strangers but did not trust Tom or her mother. She was naïve when she should have been cautious, cynical when she should have been more trusting, which did cause many of Lola's problems. Other issues, such as with Tom, were not in her power to control. I did want to like Tom and believe in him, but his immediate involvement with someone else and his inability to make it clear to this other woman that he had feelings for Lola didn't exactly endear me to him. I thought he was too wishy washy in some areas, but he was also protective of Lola when he saw she was in danger and comes to her rescue making him a hero in the end. Tom also provided a wry sense of humor to the story that gave him an irresistible charm. Lola's mom is a sensible character I really liked and she helps keep Lola grounded by offering sage advice and insights. Rosanna Rae is married with three grown-up sons and lives in Livingston, Scotland. She previously studied Social Science subjects with the Open University and has a B.A. (Open). After bringing up her family, she worked full-time for twenty years doing secretarial work in Edinburgh. Rosanna has wanted to write fiction since she was about ten years old, at which age she read and was inspired by Charlotte Bronte’s Jane Eyre. She is pleased to be now fulfilling her early ambitions. She has written five books since 2007. Her novels are entitled ‘LYNSEY’S SECRET',‘JO’S DILEMMA’, ‘KAREN’S AFFAIR’, ‘APRIL’S MAN’ and 'LOLA'S MONEY' (in chronological order). She is currently writing her sixth novel.